Do football players do this many squats? Probably not, but the free Super Bowl weekend workout burned plenty of calories. The First & 10 workout had plenty of energy. Do football players need to do a lot of air squats to get ready for a game? I mean, I know that when they’re assembled in a line and waiting for the whistle, they’re frequently crouched, spring-loaded, with one hand on the ground. Maybe they bend their knees a little when they huddle? As the previous sentences likely reveal, I do not really know the rules or lingo of football, so it stands to reason I might also not know whether football players do a lot of squats without weights when they work out. My guess is that they don’t. 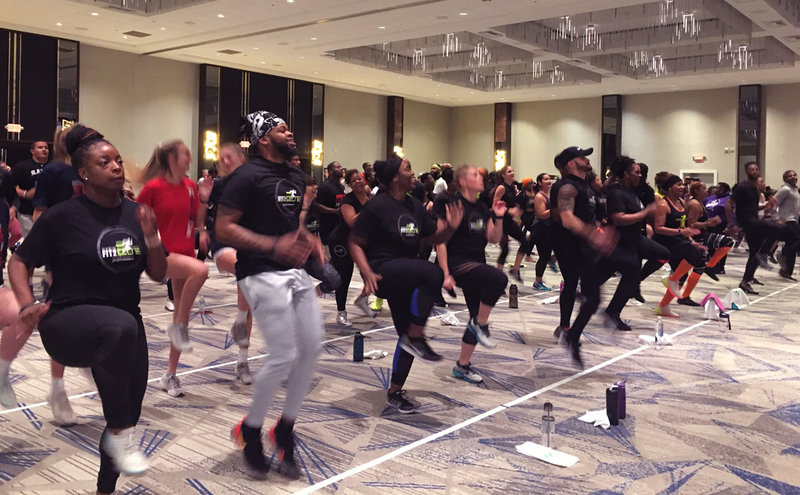 This didn’t stop Torch Fitness and 10 of its trainers from directing a room full of fitness fans in a ballroom at the W Atlanta-Midtown to do a remarkable number of air squats during “First & 10” on Super Bowl Saturday. 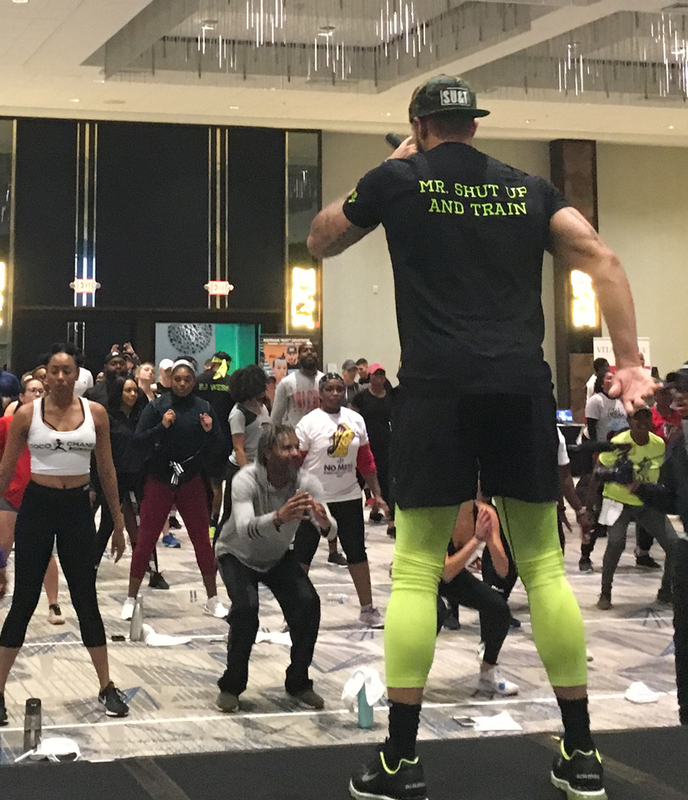 At the free fitness event, part of a series at the hotel, each trainer took turns leading the whole room through a series of exercises. Squats, as I said, featured prominently. So did hopping up and down and lunging. But the lack of creativity and variety in the workout didn’t faze the 100 or so people who showed up to sweat. They screamed when DJ Sumo played “Apes–t” by the Carters and seemed downright gleeful to be doing yet another set of lunges or high knees. To be fair, the team at Torch—a 12-year-old personal training and group fitness company in Atlanta—was leading a class that included all fitness levels and all ages. And what the trainers may have lacked in inventiveness they definitely made up for in energy. In matching black shirts, each emblazoned with the coach’s nickname, they ran through the room and made sure to bounce higher and squat deeper than everyone else. One trainer even dropped the mic after her segment. One of the instructors leads a workout at the First & 10 Workout. That energy kept my mind off all of the squats, and bouncing squats, and squat jumps. And it kept me going for 44 minutes, during which time I burned about 404 total calories. So it was effective and fun. Football-related? Tenuously, maybe. But definitely fun.